Quite a thrilling prospect for the neutral this. Two titans of international cricket locking horns for their respective counties. I refer, of course, to Jimmy Anderson and Shaun Udal. 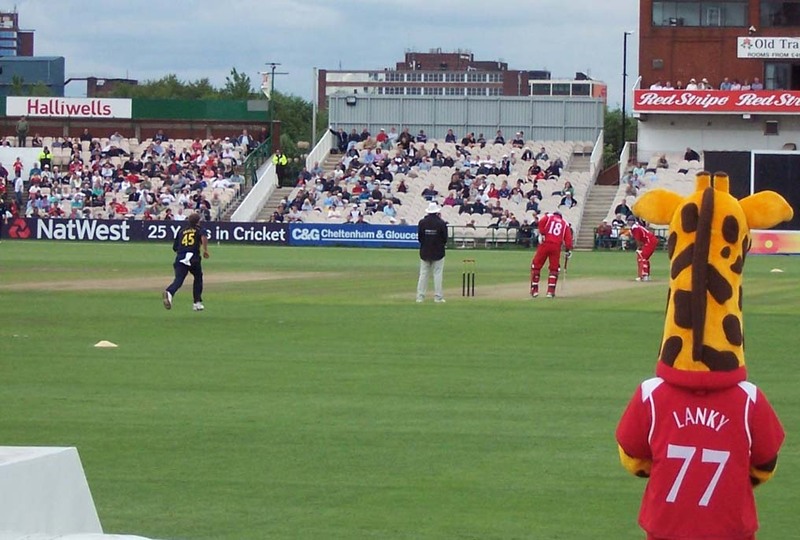 There also seems to be a smattering of interest in Hampshire's Shane Warne and Lancashire's Muttiah Muralitharan. The two leading Test wicket takers of all time. As it goes, neither I nor my colleague are neutral, and are firmly in the Hawks camp. 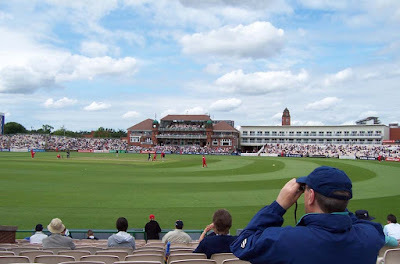 I was at the corresponding fixture last year, which Lancashire won at a canter, as they have the last twenty one-day meetings between the two sides, Hampshire's last victory coming in 1992. Todays game could go either way, as while my county are looking determined to beat all comers in the County Championship top division, after last year's Warne-inspired promotion from Div 2, their Totesport league form has been lacklustre. Great white hope Kevin Pietersen hasn't exactly been firing on all cylinders in preparation for the inevitable England call-up and Hampshire lie second bottom of the Totesport first division. However our other England hopeful, Chris Tremlett, looks in fine form and might be a good outside bet to tour with England this winter. On top of that, Warney's positive play and talismanic prescence have been vital to our recent successes. 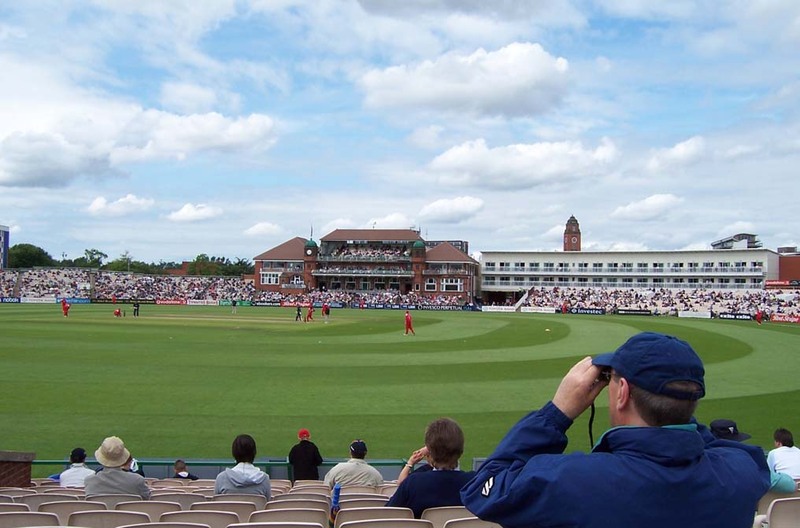 Despite nearing the top of the Totesport division, there is seemingly great disquiet among Lancashire supporters, certainly those we sit beside come their teams innings, about the standard of cricket being played at Old Trafford at present. Relegation from the County Championship top flight last season was a severe blow. When we hear that our wicketkeeper/batsman Nic Pothas is injured and the greying, mostly bald figure of John Crawley has to keep, we figure this could be a problem, and also with Derek Kenway in the side, things look problematic. After being persuaded to stay with Hants a few seasons back, Kenway has looked fairly lacklustre when he has broken into the side. However as the Hants innings starts briskly, it is Kenway who shines, reaching 50 from 68 balls and eventually getting to 65 before being decieved by Murali's wizardry. Shane Warne promotes himself to 3 after Greg Lamb falls for 11 to bash some quick runs while the field is still restricted. However he undoes himself going for a tight 2 and is run out for 15. Pietersen and Ervine contribute about 30 each, including a huge 6 from the South African/Englishman, but the Hampshire innings peters out to 200, when a much higher score looked likely at 108-2. It should be noted that Jimmy Anderson bowls an extremely tight spell of 2 for 18 from 7 overs that bodes well for him in his attempt to overcome his international yips and return to the England fold. As Chris Tremlett opens the bowling for Hants from the Streford End, a thick trail of black smoke climbs into the sky from a building somewhere in Manchester. Within 4 overs the Hampshire attack has inflicted similar devastation, Lancashire reeling at 16-3, a particularly nimble catch from old man Crawley off Tremlett summing up Hampshire's determination. 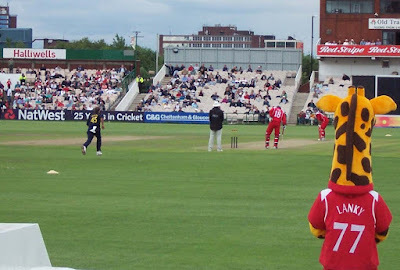 Lanky the Giraffe, who has been shuffling around the boundary all game, dancing to the soundtrack in his head all afternoon, becomes a touch less energetic. Warne is the subject of light-hearted booing and drunken banter throughout the day, and especially so when he downs a catch at slip off unpretentious fast-medium man Billy Taylor. However, in the next Taylor over, he makes amends leaping and stretching to take a one-handed pearler, provoking awe all round. Lancashire, despite a dogged captain's innings from Mark Chilton never really recover and 'Shaggy' Udal tidies up the tail with some neat off-spin including one that is caught by Ervine in the deep, diving at full tilt with a triple pike and a tuck, if I remember correctly. It rivals Warne's for the amount of jaws that subsequently drop. Certainly I let out one of several loud 'YES's, but thankfully, being cricket, I don't get roundly leathered by the home support that surround me, although I imagine they feel a little ticked off by their side's capitulation, and our unrepentent glee in their midst. However, it should be noted that this was a brilliant display of bowling with all of the Hants attack contributing. Is it too much to hope that Hampshire may win something this season? It's certainly seems within reach, and that hasn't been the case since David Gower, Robin Smith and MCJ Nicholas brought grace, power and solidity to Hampshire's batting line-up. These days its our bowling that dazzles, but a similar air of confidence is starting to swirl around.